The nation was once again gripped in what turned out to be a very hot debate when Jah Prayzah, the man of the moment, (whose moment has become pretty long actually, to think of it) released yet another song this past week. The media rolled out a tongue, at least those that are always prone to such, and licked Jah Prayzah as having scored a first and what have you in his ‘‘history making’’ exploits and so on and so forth. There are those that lick the chap so much that one day he may disappear and his status will read ‘‘last seen being licked by so and so’’ . . . but we digress. The others were rather sober and made a better attempt at making a critique. The media of those ordained in the Jah Prayzah cult swore by their first commandment that Jah Prayzah had produced a scorcher. After all their first and only commandment is ‘‘Jah Prayzah is always right’’. The others, well they thought Jah Prayzah had messed up big time in both the song “Ronika” and the video. But is the song truly that bad and has the man from Uzumba really gone off the rails with this new release? Actually, this could be the best song to show the genius of Jah Prayzah in all its full force and might. Those who tore into Jah Prayzah said his song was a disaster both lyrically and audio-graphically. They just may have a point. Only just. Jac Mtandwa wrote on social media, Facebook to be precise; “It’s trash . . . below par for one of JP calibre. No message.” Kipa Nemukati and Tinashe Mutero thought it was also hogwash although they tried to delete their thoughts forthwith while Plot Mhako had to reach for his medical aid after falling terribly ill following an encounter, or encounters, with the song. The thing is, there is a bit of folly in someone who tunes in to a Jah Prayzah song and expects to hear a song pregnant with lyrical artistry and sophisticated messaging that leaves the mid enriched and a tad more sophisticated. Especially since this is a party song and party songs can really lack any coherent meaning but are meant to make someone jump up and down and forget their troubles and other woes. Expecting such deep lyrics from Jah Prayzah especially is much like someone who is studying towards a degree in philosophy hopping off to the nearest kindergarten library with the hope of finding useful material amongst the books of Winnie The Pooh, Alice In Wonderland or Pinocchio. Unless you are writing a thesis on the impact of children’s books on their reading patterns and language, you will never find anything there of use. You are looking for the right thing in the wrong place. Or that person. You know? That one person who goes with their scuba diving equipment, straps it on snugly and takes a quiet plunge in the shallow end of a primary school swimming pool. Not a rewarding idea. Jah Prayzah, like the legendary writers of what is called Nonsense Literature, can hardly stitch together coherent songs with deep meanings which leave one lyrically enriched. Like Edward Lear’s Jabberwocky, the lyrics are there for rhyme and fun and meant to leave someone giddy. They are lyrics which one can use to train the human child the art of speaking as their first words. Easy to recite while not tough on the brain. They are words you can also use to teach those who have suffered loss of speech in very nasty adult accidents to regain the precious art and, God willing, speak again. But to want him to be a master lyricist; that is not his hallmark as he has no (prolific) history of philosophical deep lyricism. And expecting him to do so is unfair because that is not his niche. At all! And so did Jah Prayzah deliver a song with words, phrases that rhyme and can form a sentence? He did and for that he gets full marks in the lyric writing department. End of argument with no possibility of appeal against judgement! “Ronika na Rokadhiya Ramekin a Mbudziyadhura/Makumbo ndamagura nekutamba ndini ndakonzera . . . ” he sings in the opening verse. That rhymes for certain and means JP has scored maximum points. 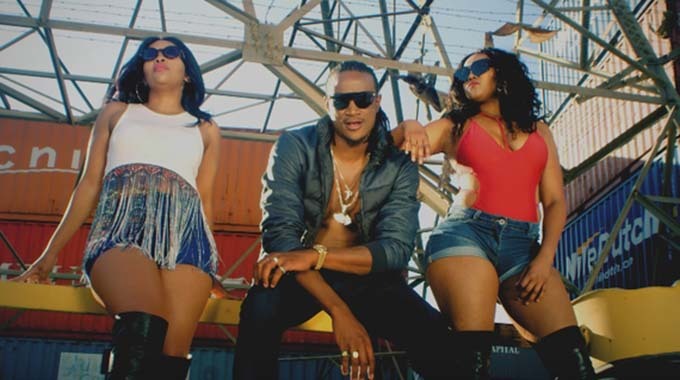 Others have argued that Jah Prayzah put together a video that was not exactly the golden standard for music video cinematography from casting of the rather chunky girls right down to the general video concept. The truth is Jah Prayzah made a decent video and was only being compared to himself. The chunky girls could never have been better for what was probably meant to be a dance song. And skinnier and it would have been like watching crochets knitting together a doily. Yet it is the music that many people are and were worried and occupied with. Others said the song was absolute hogwash and ought not be played. That it is a waste of precious resources which he could otherwise have spent on his other ‘‘kids’’ in the stable. But we all know Jah Prayzah does not spend money on anyone other than himself. Investing in his name at every turn and breath in the Military Touch Movement. He can only be rivalled in the cult creation scene by Jim Jones as everything seems to revolve around him. Even the best song of the moment, ‘‘Pahukama’’, by stable mate Ex Q is a sign of how we pay homage to Jah Prayzah before everyone else. It is Ex Q’s song but it starts with the words; “Jah Prayzah is done…” Brilliant deification. But we digress. It is ‘‘Ronika’’ who we are focussed on. There is another pressing criticism of Jah Prayzah’s new song, some say it is not catchy at the very first playing. Others have not played it all to the end because it has soured before they got to the end. Others have had a couple of hundred listens and still haven’t felt the ‘that’ in the song. The inclination is to agree with her. With all due respect many, if not most of the songs that became hits for Jah Prayzah started off as difficult to understand and love and then they eventually settled. After that they become scorchers. Jah Prayzah’s music is much like having an ugly baby . . . he grows onto you. No matter how ‘‘ugly’’ he is upon first sight. They have a name for it — a face only a mother can love! And so it is with his music and with time we will all see some beauty in “Ronika”. But that is not his genius. Remember the notion that Jah Prayzah is selfish and wants ‘‘everything’’? Well that is the genius which “Ronika” exhibits. Jah Prayzah loves winning and to be the best at everything. If “Ronika” doesn’t become the best song this season it will be something else; the worst! Jah Prayzah wants to produce, every year, the best song and the worst song of the year so that he takes all the awards good and bad. When you are all thinking he made terrible mistakes in Angelo with Jah Cure, My Lilly with Davido and now “Ronika”, it’s just Jah Prayzah ensuring he is a master of everything great and small! Could there be a better genius?